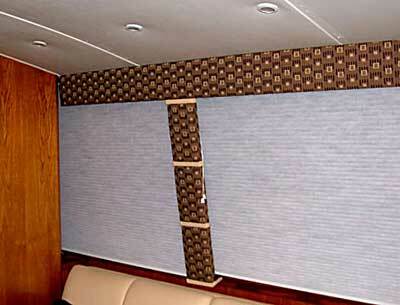 The valances have browns and other muted tones that give little contrast to highlight the teak. In addition the valances are going to be moved out and dropped down slightly to allow the air conditioning to flow out and fall into the room from above the valance. We are going to bring in blues and other colors to give contrast and brighten the boat. When we could not find the exact fabric that we wanted, so we decided to make our own. A collaboration between C&C, Dockside Canvas and ourselves produced this fabric. 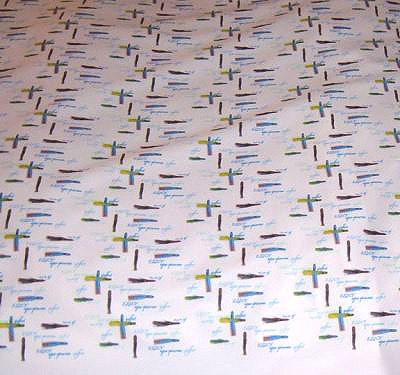 C&C helped us come up with the design and Dockside was able to print this one-of-a-kind fabric. 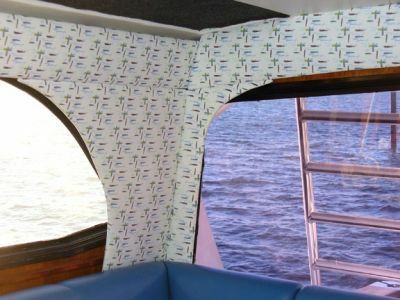 By creating our own fabric design, we were able to make it very personal and bring the colors we wanted into the cabin. 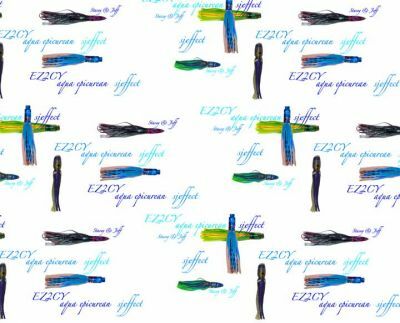 While it may be difficult to see the detail in this photo, the print consist of lures and calligraphy on a white fabric. 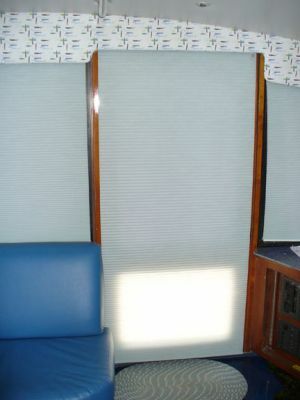 The valance on the upper left covers the air-conditioning troft and is mounted approximately 1 1/2" from the top. This allows air to flow into the room. The valance on the upper right covers the door slide frame-work. The corner boards serve the purpose of covering the water hoses going to the bridge and will also will be used to keep blinds securely in place. Note that the color of the couch pulls the blue colors from the valance and brings it all together. The Duette blinds from Hunter Douglas are in a very pale aqua color that pulls out of the valance material. Duette's honey-comb design makes them very good for insulative qualities. We chose semi-opaque that provides privacy yet allows light to come through. The LiteRise feature mean no strings. You just pull them up or down to the position desired. For the doorway we opted for the UltrGlide feature. The blind glides to the closed position effortlessly with the simple nudge of the string on the upper right. 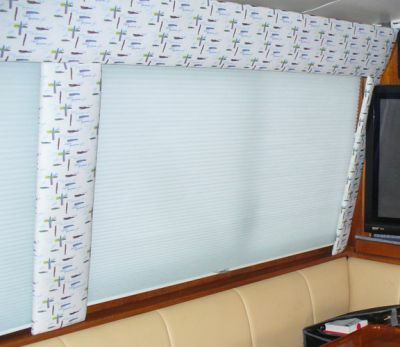 To open the blinds you pull the retracted cord until the blind is in the desired position. There are no dangling strings to deal with. The bottom portion is brighter because the tint on the bottom of the door is not the same as the top.